Wheat berries are an amazing ingredient. You can use them for breakfast, desserts, salads, risotto-type dishes, you can add them to soups and stews. Since I am always searching for side dishes to incorporate in our menu, wheat berries are a great alternative to give some rest to the usual suspects: rice, pasta, and couscous. The other day I was feeling adventurous, and decided to create my own recipe for them. Problems started right away. A search on my cookbooks and online sources left me surprised (and quite puzzled) at the many different methods used to cook the grain. Some people swear you must soak them overnight. Some insist you need a pressure cooker. I threw caution to the wind, didn’t soak them, didn’t invite the pressure cooker to play, but simply cooked them in salted water as if preparing pasta. It took a little over 1 hour to get them the way I wanted: tender but not mushy. After that, I incorporated them with two veggies I adore, and… side dish mission accomplished! Heat the oven to 420F. Cook the wheat berries in plenty of salted water until al dente (depending on the brand, it might take from 1 to 2 hours). When cooked to your taste, drain, and reserve. If not using immediately, add just a little drizzle of olive oil to prevent the grains from sticking too much. Can be prepared a couple of days ahead. While the wheat berries are cooking, place the diced butternut squash in a bowl, and drizzle olive oil just enough to lightly coat the pieces. Season the squash with salt, pepper, and smoked paprika. Add them in a single layer over a rimmed baking dish. Roast in the hot oven until cooked, and the edges start to brown (25 to 35 minutes). 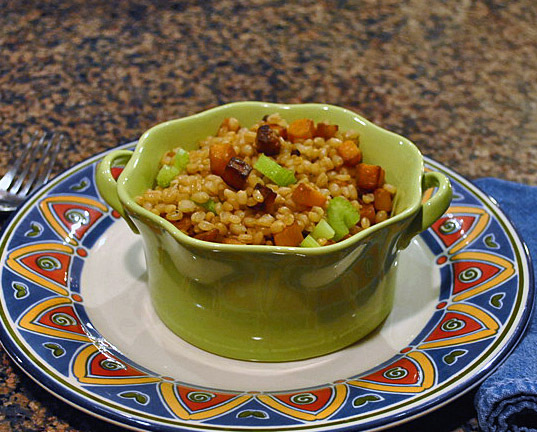 Mix the cooked wheat berries with the roasted squash, add the raw celery, incorporate everything together gently. Adjust seasoning, and serve. We both loved this recipe! Roasted butternut squash has a special place in my heart, and now stores in our neck of the woods carry those cute little bags with the cut veggie, so I often cave and bring those home to make my life easier. We are also quite fond of raw celery. In this recipe, it gave the needed “crunch factor” to oppose the chewiness and softness of the wheat and squash. The squash, when roasted, tastes a little sweet, so the smoked paprika and the celery help cut through that. We enjoyed this dish with grilled pork tenderloin, but of course it goes well with all sorts of main dishes, standing also on its own if you add a hearty salad.